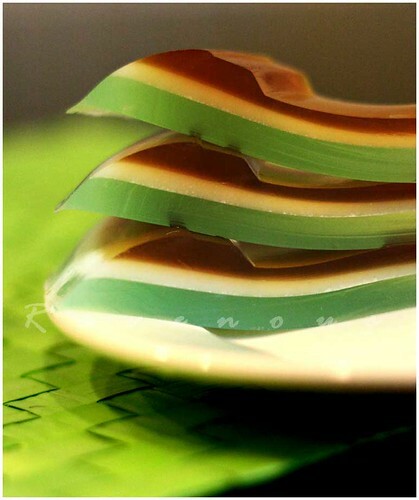 Ever wonder what those attractive tri-colored gelatin in Vietnamese deli and banh mi shops were? It’s coffee, coconut, and pandan flavored agar, a gelatinous substance derived from seaweed. Now don’t let that scare you off…agar is vegetarian and an extremely popular ingredient for Asian desserts, including this popular Vietnamese variety. Pandan (pandanus amaryllifolius) is a tropical plant with a jasmine-like aroma and is very commonly used as a flavoring agent in Asian cooking, often steeped in coconut milk. Pandan leaves are often found frozen in Asian groceries, but bottles of flavoring extract can also be found. He loves the aroma of pandan, I love the boldness and flavor of coffee, and we both love the sweetness of coconut. This dessert is so fun and easy to make and the flavors of coconut, pandan, and coffee work surprisingly well together. Have multiple, ideally 3, small saucepans ready. Split the agar packet into thirds for each layer. The amount of condensed milk/sugar is really up to you as some people like this mildly sweet and some really sweet, so adjust according to your tastes. For the coffee layer, heat about 1.5 cup of water in small pot, add about 1/3 of the agar packet, stir constantly until the agar dissolves. Add 2 tbs of instant coffee, add about 2 tbs of condensed milk or 2 tbs of sugar and a drop of vanilla extract. Taste, adjust condense milk/sugar to your taste and bring to boil. Carefully pour this into your mold. This will slowly set so in the meantime, start the next layer. For the coconut layer, heat about 1 cup of water and can of coconut milk. Add 1/3 of agar packet and stir constantly. Add about 2 tbs of condensed milk or sugar and then adjust to taste and bring to boil. Before adding to the bottom coffee layer, check to make sure it is not fully set…test with your finger–it should not perforate through but spring back but still slightly sticky. You don’t want it too soft or else the coconut will just mix with the coffee. Conversely, you do not want it to completely harden or else the layers will slide apart when cut. Carefully ladle on the coconut layer to the slightly hardened, but sticky coffee layer. 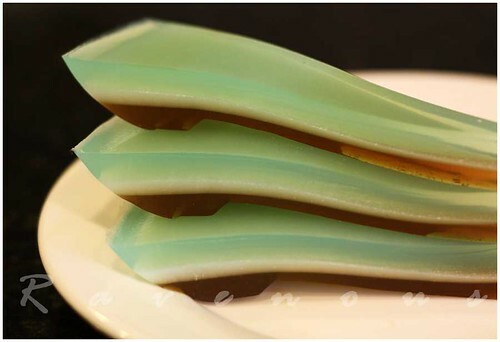 Finally, for the pandan layer, heat about 1.5 cup of water, the rest of the agar packet, 1 tbs of pandan extract (if using pandan leaves, tie in bundle with twine and remove at last minute), 2 tbs of condensed milk or sugar, and a drop of vanilla extract and 2 drops of green food color. Stir constantly and adjust to taste and bring to boil. Now you’re ready to add the final layer. Again, before adding this layer, check to make sure the coconut layer is slightly hard and still sticky to the touch and then carefully ladle this on. Let the jelly cool at room temperature or refrigerate to quicken the process (around 10 min-the thinner and larger surface area, the quicker it will set) and enjoy! Very interesting. I've never had it before. Oooh, that looks so classy, almost too beautiful to eat! Thach is one of my all-time FAVORITE desserts. The pandan layer makes me swoon the most. I know it's a lot cliche, but I could SO go for some right now. Even if it's 20 minutes till midnight. This looks soo nice. Colorful thach is more popular in Saigon than in the north. I loved them so much when I wasin the South. I love the coffee flavours in your creation. That looks lovely! I just got some agar recently, but haven't been able to find pandan. Well, I probably just wasn't looking hard enough – I'm sure the market where I got the agar has to have pandan somewhere. What a gorgeous dessert! This would definitely get a lot of wows if you brought it to a party. My parents enjoy eating this, so one of these days, I will surprise them with this dessert! 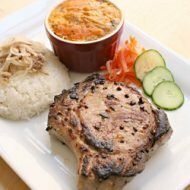 I love reading your classic Vietnamese-inspired dishes! hummingbird: Try it sometimes..it's very refreshing! Gastronomer: I wonder how it's like in VN when you had it. We never had it in VN. anna: let us know if you make it and send us pix! Kirby: We'll have to find red dragon fruit to try your recipe. Food Addicts: Thanks again guys! nikki: Thank you very much! it's always hard to take food photos since we're always wanting to eat it! looking forward to making this. just a question on the "instant coffee". In this case, are you talking about the grounds, the brewed liquid coffee, or the powdery stuff? I've seen different sites and they all mean different thing. 😀 love this website! tyvander: the powdery stuff…although we don't see why you can't use brewed coffee with the appropriate amounts of water. We think our recipe is not very sweet, but that's sorta how we like it..so adjust according to your taste. There's tons of different ways this is made, we just had one where they put a layer of flan on top! this dessert looks delicious, I would try it someday. i have pandan paste. Do I still use 1 tbsp.? Doan: start with a small amount say 1 ts and then adjust according to your taste..let us know how it goes! I made this dessert last night. I added more water than indicated in the recipe. It turned out very very good. My kids love them. Thank you for the recipe. I used the recipe and my jelly was too firm. I doubled the amount of water and it was still firm. I did not get the right texture or flaovrs (like jelly bought from Vietnamese stores and those from childhood in Vietnam). Thanks a lot for sharing.Will this jelly melt after take out of the refrigerator? How long it survive without melting? I love agar agar as it is so easy to use and it doesn't have that animal smell to it unlike gelatine. The jelly is great for hot weather, and it looks impressive for guests since it looks fancy with the pretty layers. Hi…Just wanted to say that your blog is Great!! Just happened to come across it trying to find out how to make some vietnamese food. It's sad to say that I'm vietnamese and can't cook it. Some of the food that you have posted brings back memories of my childhood. Keep up the good work. I will be returning often to get some more ideas. You don’t need Pandan you can get pennyworts put it in a blender and blend it with water than drain it in a fine teafilter. 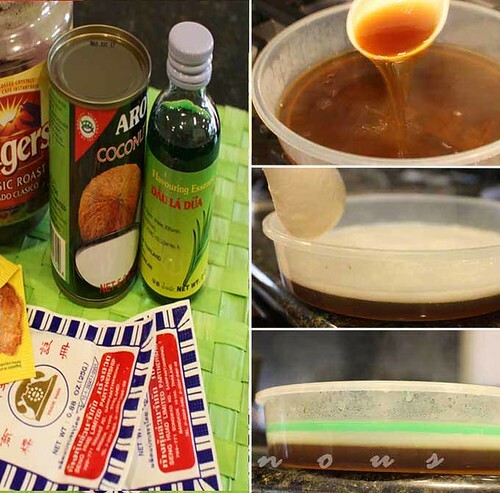 Hi, if I divided the agar into 4 parts since I’ll be making 2 layers of coffee and 2 layers of coconut. Could you tell me what the recipe would be? Hi! First, I would like to say that your Thach Rau Cau looks AWESOME! I made mine last night using your recipe and mine came out very firm, it definitely didn’t look like yours. I placed it in the fridge, is that why it’s firm? I know it’s not supposed to be this firm, because I have had this dessert many times and it was never this firm. 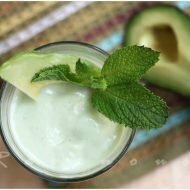 Please help me as soon as possible because I would like to make this for New Years. if it’s too firm, decrease the amount of thach, maybe half and use the same amount of water. good luck! I made the pandan jelly with fresh leaves today and your recipe is spot on! It’s not too sweet and has the perfect consistency. Thanks for the recipe! Looking forward to testing out more of your recipes! I followed your recipe very carefully and measured the ingredients precisely but I think something is wrong with this recipe. coffee base has no problem but the coconut layer did not set! i placed it overnight in the fridge went to bed, woke up at 9am and still did not set. The agar agar pack is only 25gm. divide it by 3 you get 8.333 on each. with the coffee jelly, it calls for 1.5 cups of water. The jelly set in 10-15min in the fridge. no problem. coconut layer calls for 1 cup water & 1 cup of coconut milk. i think it was too runny and too heavy. The jelly did not set. i googled the knox gelatin on the net. it says jelly with milk or coconut will take longer time to set but this was did not set at all. 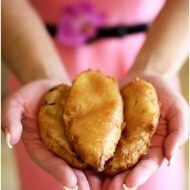 my first attempt on this recipe was a total failure! Totally disappointed!